Kerry Jane Aston received a National Learners Award supported by NIACE during Adult Learners Week 12 -18 May 2012. The individual award was for the catergory Learning Through Craft Award sponsored by BIS Department for Business Innovation & Skills. Kerry was presented with her award at the National Awards ceremony on Monday 14th May 2012 in London, following a nomination by Natalie Carline-Bruce from Wolverhampton Adult Education Service. 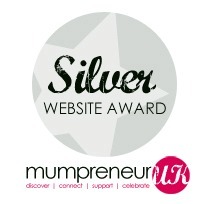 We were delighted to receive a silver website award from mumpreneur UK, here is what they had to say. ‘Your website was considered by three professionals within the online industry who marked your site based on the criteria provided to them by Mumpreneur UK. On adding the scores together, we’re delighted to inform you that you have won a Silver Website Award! Congratulations! !